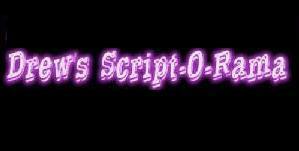 Drew's Script-O-Rama: free movie scripts and screenplays, baby! The above right hand link is the jazzed up (yet java-free) version of Drew's Script-O-Rama, the place you know and love for free scripts and screenplays. It is best viewed at 1024x768, but don't fret, It'll work at lower screen resolutions too. The boring version (yawn) is still on the above left, if you wanna be that way. C'mon in already, and then close the door, will ya? I'm not trying to heat the whole neighborhood!